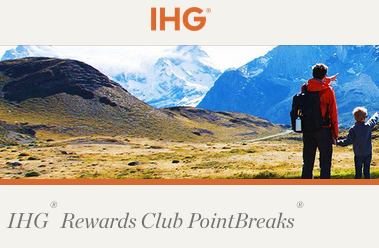 The latest IHG Rewards Club PointBreaks hotel are now available for booking for 5,000 points to 15,000 points per award night for stays until Sep 30, 2018. Remember the PointBreaks rules are that a member can only book up to 2 reward reservations per hotel participating in the individual offer. My tip to get around this would be to book 2 reservations with one IHG Rewards Club account and then have your spouse book 2 more etc. Of course this is dependent on both accounts having enough points to redeem for these awards. Also be sure to book these ASAP as soon as the list comes out as once the allotted nights are booked at certain locations those hotels will fall off the list. If you don't have enough points, even 0, you can buy points right now with up to a 100% bonus if you buy 26,000 or more points which works out to 0.5 cents per point. That means you can get each of the PointBreaks hotels for as little as US$25 per night. You can buy points with the bonus here until Aug 22, 18. An example of a good deal on this list the InterContinental Doha. This hotel normally starts at 35,000 points for standard room so the 15,000 point rate is more than 50% off. Something to look at if you are heading to Qatar between now and October!